USES: Budesonide is used to control and prevent symptoms (wheezing and shortness of breath) caused by asthma. This medication belongs to a class of drugs known as corticosteroids. It works directly in the lungs to make breathing easier by reducing the irritation and swelling of the airways. This medication must be used regularly to be effective. It does not work immediately and should not be used to relieve sudden asthma attacks. If an asthma attack occurs, use your quick-relief inhaler as prescribed. OTHER USES: This section contains uses of this drug that are not listed in the approved professional labeling for the drug but that may be prescribed by your health care professional. Use this drug for a condition that is listed in this section only if it has been so prescribed by your health care professional. This medication may also be used to treat lung diseases such as bronchitis and emphysema. HOW TO USE: Read the Patient Information Leaflet provided by your pharmacist before you start using this medication and each time you get a refill. Follow the illustrated directions for the proper use of this medication. Make sure you understand how to operate the breathing machine (compressed air jet nebulizer with face mask or mouthpiece) and how to properly clean it to prevent infections. If you have any questions, consult your doctor, pharmacist, or respiratory therapist. Do not use this medication in an ultrasonic nebulizer. Do not mix budesonide suspension with other medications in the nebulizer. A parent or other responsible adult should supervise a child who is using this machine. If you have any questions, ask your heath care professional. Shake the container gently before use. The dosage is based on your medical condition and response to treatment. This medication comes in different strengths. Check that you are using the correct strength. Inhale this medication by mouth, usually once or twice daily or as directed by your doctor. While inhaling this medication, breathe calmly and deeply until the mist stops, usually over 5 to 10 minutes. Avoid getting the medication in the eyes. To prevent dry mouth, hoarseness, and oral yeast infections, gargle and rinse your mouth with water after each use. Do not swallow the rinse water. Also, wash your face where the face mask/mouthpiece has touched your skin to prevent skin reactions and irritation. Use this medication regularly in order to get the most benefit from it. To help you remember, use it at the same time(s) each day. Do not increase your dose, use it more frequently, or stop using this medication without first consulting your doctor. If you are using other inhaled medications, ask your doctor when to use each of the medications. Be sure you understand which asthma medications to use on a regular schedule (controller drugs) and which to use as needed for sudden asthma attacks (quick-relief medications). Ask your doctor ahead of time what you should do if your breathing worsens (for example, if you have increased coughing or shortness of breath, or if you wake up at night with breathing trouble). If you are regularly using a different corticosteroid (such as prednisone), you should not stop using it unless directed by your doctor. You may have withdrawal symptoms if the drug is suddenly stopped. Some conditions (such as asthma, allergies) may become worse when the drug is suddenly stopped. 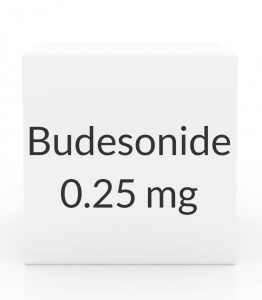 To prevent withdrawal symptoms (such as weakness, weight loss, nausea, muscle pain, headache, tiredness, dizziness), your doctor may direct you to slowly lower the dose of your old medication after you are using budesonide. Consult your doctor or pharmacist for more details, and report any withdrawal reactions immediately. See also Precautions section. You may notice a benefit within 2-8 days of starting this drug. It may take up to 4-6 weeks of regular use before the full benefit of this drug takes effect. Keep track of how often you need to use your quick-relief inhaler and tell your doctor. If your quick-relief inhaler does not seem to work as well or if you need to use more than usual of your quick-relief inhaler for 2 or more days in a row, seek immediate medical attention. Inform your doctor if your condition persists or worsens. SIDE EFFECTS: See also Precautions section. Dry/irritated throat, hoarseness, voice changes, bad taste in the mouth, runny nose, or nosebleeds may occur. If any of these effects persist or worsen, notify your doctor or pharmacist promptly. Remember that your doctor has prescribed this medication because he or she has judged that the benefit to you is greater than the risk of side effects. Many people using this medication do not have serious side effects. Infrequently, this medication may cause severe sudden worsening of breathing problems/asthma immediately after use. If you have sudden worsening of breathing, use your quick-relief inhaler and seek immediate medical attention. Because this drug works by weakening the immune system, it may lower your ability to fight infections. This may make you more likely to get a serious (rarely fatal) infection or make any infection you have worse. Tell your doctor immediately if you have any signs of infection (such as ear pain, sore throat, fever, chills). Use of this medication for prolonged or repeated periods may result in oral thrush (yeast infection). Contact your doctor if you notice white patches in your mouth or on your tongue. Tell your doctor immediately if any of these rare but serious side effects occur: unusual tiredness, vision problems, easy bruising/bleeding, puffy face, unusual hair growth, mental/mood changes (such as depression, mood swings, agitation), muscle weakness/pain, thinning skin, slow wound healing, increased thirst/urination. A very serious allergic reaction to this drug is rare. However, seek immediate medical attention if you notice any symptoms of a serious allergic reaction: rash, itching/swelling (especially of the face/tongue/throat), severe dizziness, trouble breathing. This is not a complete list of possible side effects. If you notice other effects not listed above, contact your doctor or pharmacist. In the US - Call your doctor for medical advice about side effects. You may report side effects to FDA at 1-800-FDA-1088. In Canada - Call your doctor for medical advice about side effects. You may report side effects to Health Canada at 1-866-234-2345. PRECAUTIONS: Before using budesonide, tell your doctor if you are allergic to it; or if you have any other allergies. This product may contain inactive ingredients, which can cause allergic reactions or other problems. Talk to your pharmacist for more details. Before using this medication, tell your doctor or pharmacist your medical history, especially of: eye disease (such as cataracts, glaucoma), high blood pressure, liver disease, thyroid problems, diabetes, stomach/intestinal problems (such as diverticulitis, ulcer), bone loss (osteoporosis), current/past infections (such as tuberculosis, positive tuberculosis test, herpes, fungal), bleeding problems, mental/mood conditions (such as psychosis, anxiety, depression). If you have switched from a corticosteroid taken by mouth (such as prednisone tablets) to this inhaler within the past 12 months, or if you have been using this product in higher-than-usual doses for a long time, it may be more difficult for your body to respond to physical stress. Therefore, before having surgery or emergency treatment, or if you get a serious illness/injury, tell your doctor or dentist that you are using this medication or have used a corticosteroid taken by mouth within the past 12 months. Tell your doctor immediately if you develop unusual/extreme tiredness or weight loss. Carry a warning card or medical ID bracelet that says you use (or have used) corticosteroid medications. Before having surgery, tell your doctor or dentist about all the products you use (including prescription drugs, nonprescription drugs, and herbal products). This medication may mask signs of infection. It can make you more likely to get infections or may worsen any current infections. Therefore, wash your hands well to prevent the spread of infection. Avoid contact with people who have infections that may spread to others (such as chickenpox, measles, flu). Consult your doctor if you have been exposed to an infection or for more details. Budesonide may cause vaccines not to work as well. Therefore, do not have any immunizations/vaccinations while using this medication without the consent of your doctor. Avoid contact with people who have recently received live vaccines (such as flu vaccine inhaled through the nose). This medication may slow down a child's growth if used for a long time, but poorly controlled asthma can also slow down growth. The effect on final adult height is unknown. See the doctor regularly so your child's height can be checked. Tell your doctor if you are pregnant before using this medication. Infants born to mothers who have used corticosteroids for a long time may have hormone problems. Tell your doctor immediately if you notice symptoms such as persistent nausea/vomiting, severe diarrhea, or weakness. This drug passes into breast milk and may have undesirable effects in a nursing infant. Consult your doctor before breast-feeding. DRUG INTERACTIONS: The effects of some drugs can change if you take other drugs or herbal products at the same time. This can increase your risk for serious side effects or may cause your medications not to work correctly. These drug interactions are possible, but do not always occur. Your doctor or pharmacist can often prevent or manage interactions by changing how you use your medications or by close monitoring. To help your doctor and pharmacist give you the best care, be sure to tell your doctor and pharmacist about all the products you use (including prescription drugs, nonprescription drugs, and herbal products) before starting treatment with this product. While using this product, do not start, stop, or change the dosage of any other medicines you are using without your doctor's approval. Some products that may interact with this drug include: aldesleukin, other drugs that weaken the immune system (such as azathioprine, cyclosporine, cancer chemotherapy, natalizumab), mifepristone, quinolone antibiotics (such as ciprofloxacin, levofloxacin). Other medications can affect the removal of budesonide from your body, which may affect how budesonide works. Examples include azole antifungals (such as ketoconazole), macrolide antibiotics (such as erythromycin), rifamycins (such as rifabutin), St. John's wort, drugs used to treat seizures (such as carbamazepine, phenytoin), among others. This product may interfere with certain lab tests (such as skin tests). Make sure laboratory personnel and all your doctors know you use this drug. This document does not contain all possible interactions. Therefore, before using this product, tell your doctor or pharmacist of all the products you use. Keep a list of all your medications with you, and share the list with your doctor and pharmacist. NOTES: Do not share this medication with others. Learn to use a peak flow meter, use it daily, and promptly report worsening asthma (such as readings in the yellow/red range or increased use of quick-relief inhalers). Laboratory and/or medical tests (such as cortisol levels, bone density tests, eye exams, height/weight measurements) should be performed regularly to check for side effects. Consult your doctor for more details. Avoid allergens (such as pollen, pet dander), irritants, smoking/secondhand smoke, and other factors that make asthma worse. Most people with asthma or ongoing lung disease should receive a flu shot annually. Discuss with your doctor. In adults, this medication can increase the risk of bone loss (osteoporosis) if used for a long time. Talk with your doctor about your risk, and about available treatments for osteoporosis. Lifestyle changes that reduce the risk of bone loss include doing weight-bearing exercise, getting enough calcium and vitamin D, stopping smoking, and limiting alcohol. To help prevent osteoporosis later in life, encourage children to exercise and eat a healthy diet (including calcium). STORAGE: Store the ampules upright in the original foil package protected from light. Do not store in the bathroom. Keep all medicines away from children and pets. Store the US product at room temperature between 68-77 degrees F (20-25 degrees C). Do not freeze or refrigerate. After opening the package, write the date on it. Discard all ampules 2 weeks after opening the envelope. Discard any unused liquid in open vials immediately. Store the Canadian product in the refrigerator or at room temperature between 41 to 86 degrees F (5 to 30 degrees C). Once envelope is opened, use ampuls within 3 months. Discard any unused liquid in open vials within 12 hours. Do not flush medications down the toilet or pour them into a drain unless instructed to do so. Properly discard this product when it is expired or no longer needed. Consult your pharmacist or local waste disposal company for more details about how to safely discard your product.